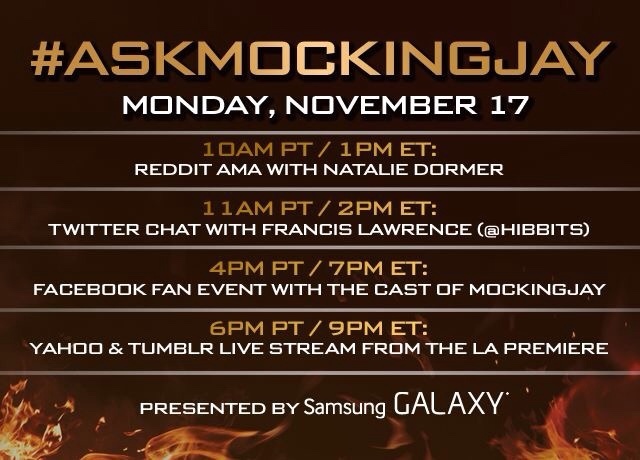 Join the cast and filmmakers of THE HUNGER GAMES: MOCKINGJAY PART 1 – including Jennifer Lawrence, Josh Hutcherson, Liam Hemsworth, Julianne Moore, Jeffrey Wright, Donald Sutherland, Willow Shields, Sam Claflin, Mahershala Ali and Natalie Dormer, along with director Francis Lawrence and producer Nina Jacobson – for a one day only global social event: #ASKMOCKINGJAY. On Monday, November 17, fans from around the world will have the opportunity to participate in a series of social media events including live chats, Q&A’s, exclusive clip debuts, and a live stream from the Los Angeles premiere. Starting TODAY, fans can submit their questions on Facebook and Instagram by using the hashtag #AskMockingjay. Tagged with: Events Facebook Instag LA premiere Mockingjay Part 1 Reddit AMA The Hunger Games: Mockingjay Part 1 Tumblr Twitter Yahoo!